Well-planned mass transport projects are essential to safeguard econo­mic progress and the standard of living in countries experiencing rapid population growth. The economic benefits of such infrastructural projects are considerable. For every €1 million invested in strategic public transport infrastructural assets, a country typically benefits double the amount invested, in addition to improved environment and quality of life for the population. If Malta really wants to become a global player attracting expertise in key fields like medicine, artificial intelligence and nanoscience, then the national public transport system needs to be efficient, reliable and impeccable, and consist of a multi-mode network. An underground metro system addresses these criteria. Having been involved in major infrastructural projects in the UK, I have experienced the approach taken to infrastructure projects overseas, where such projects are considered highly complex to implement but doable if based on thorough studies that clearly portray the long-term benefits. From a strategic perspective, it is evident that a physical connection between Malta and Gozo should not be seen in isolation but as part of a nationwide public transport system. 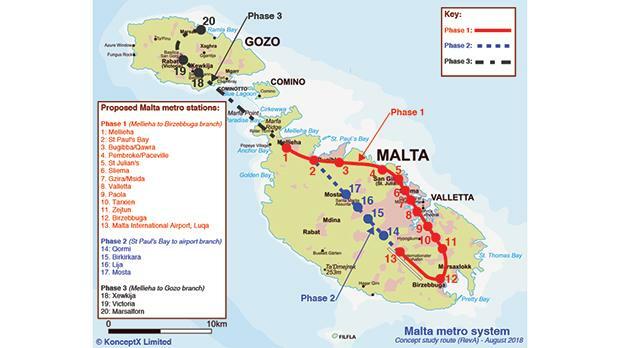 In short, there are two main strategic options available to form a permanent link between Malta and Gozo: either a vehicular connection for private cars or a link as part of a nationwide mass-transit public transport system. Considering a construction cost of €700 million to build a vehicular tunnel and assuming €30 million per year in inspections, operation and maintenance costs, and assuming 6,500 vehicles using the tunnel per day, then the cost per vehicle on a 100-year return period is likely to be nearly €30 per return trip. The cost per trip is higher when one factors in the present value of decommissioning and other whole-life cycle costs. Unless funded by tolls, this will entail an ongoing capital cost to the government, paid by the taxpayer. One also needs to consider the vehicular bottlenecks created at either end of the tunnel, putting further strain on the existing road transport system, while causing considerable further pollution to the already poor air quality. The capital expenditure required for a national underground system would be higher than a vehicular tunnel between Malta and Gozo, and could easily reach €3 billion. However, the payback period for such a project would be shorter due to the larger population it attracts, with much larger revenues from tube fares and advertisements. A metro is also hugely beneficial as it reduces the number of cars on the road, thereby cutting down on pollution from vehicles with significant cost savings in healthcare due to the ensuing reduction in chronic respiratory illnesses and increase in quality of life. A vehicular tunnel between Malta and Gozo would necessitate very long ramps at either end of the tunnel to allow cars to drive down to the tunnel level under the channel, practically doubling the amount of land required for the under-sea tunnel itself. This inherently makes a vehicular crossing costlier pro-rata and of larger detriment to the environment. In contrast, a metro system would be predominantly at the same depth, gently dipping under the channel and having vertical access via lifts and escalators at metro stations to allow passengers to reach the train platforms, thus taking up less space pro-rata. A single 25-kilometre-long metro line from Mellieħa to Birżebbuġa with a loop at the end to the airport (via Sliema, Valletta and Paola) would capture more than half the Maltese population and a large majority of the tourists visiting the Maltese islands. This metro line would then extend between St Paul’s Bay and the airport to connect Birkirkara, Qormi and Mosta, to form a loop. The line would also extend between Mellieħa and Gozo, connecting Xewkija, Rabat and Marsalforn in Gozo. The metro line would be complemented by efficient public transport shuttle bus links between the metro stations and other towns, linking for example Mosta to Rabat, Birżebbuġa to Marsascala, and Paola to the Three Cities. It would take merely half an hour by tube from Victoria to Valletta or the airport. Imagine landing at the airport and catching the metro to Gozo. Wouldn’t that be wonderful? This would be akin to landing at London Heathrow and catching the Piccadilly Line to Earl’s Court in central London. The geology under most of Malta makes tunnelling for an underground metro line less complex, and there are feasible methods of using the inert waste from such projects in environment-friendly measures. With proper planning and detailed environmental studies, the approximately three to four million tons of earth from the construction of a national underground system can be strategically used for land reclamation to form an offshore nature reserve and/or an offshore wind farm, thus helping transform our country into a carbon-neutral island, as a sustainable vision for Malta 2030. A smart person fixes the roof when the sun shines. For the economy and quality of life to keep on thriving in decades to come, Malta urgently needs to invest in vital infrastructural projects to accommodate mass public transport systems. A combination of strong leadership and long-term vision is paramount to implement such vital infrastructural projects. Dr Konrad Xuereb is a director at KonceptX, an architectural and structural engineering firm with offices in Malta and London.